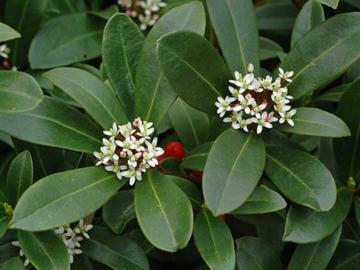 Small, low spreading, evergreen shrub. Leathery green leaves. Conical clusters of fragrant white flowers in spring, later followed by red berries. Female clone. Discovered by Philip Brown of Kew Gardens in the garden of Mrs Winifred Crook, daughter of botanist Thomas Greenlees, Bolton, Lancashire, UK.